208 pages | 43 B/W Illus. The Sociolinguistics of Survey Translation presents an overview of challenges in survey translation, introduces a sociolinguistic framework to overcome these challenges and demonstrates step-by-step how this framework works to guide and evaluate survey translation. Topics covered in the book include the relationship between linguistic rules, cultural norms, and social practices and their impact on survey translation, the role of orthography and semiotic symbols in translation, translation of different types of survey materials, and various stages of translation review and evaluation. 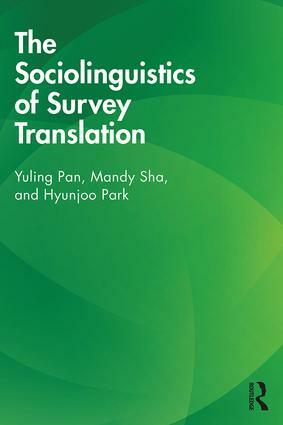 This accessible book not only demonstrates how sociolinguistics can be a useful framework to address thorny survey translation problems, but also provides practical and useful tools to guide survey translators and survey practitioners as they conduct and evaluate survey translations. Presenting easy to implement yet comprehensive survey translation methodology and providing practical tools for survey translators, practitioners and students, this book is the essential guide to this fast-growing area. "Survey translation has received relatively little scholarly attention to date. The Sociolinguistics of Survey Translation is a very welcome addition to the field. The book discusses elements from sociolinguistics and translation studies, such as speech act theory, pragmatics, cultural norms, functional equivalence, and applies them to the field of survey translation." "This volume provides a great step forward for modern survey translation by enhancing its linguistic foundation with sociolinguistic concepts. It is a marvelous tool box as well with the added benefit of examples from cultures as diverse as Arabic, Chinese or Spanish all linked to English as the source language." Dr. Yuling Pan, a leading researcher in the field of sociolinguistics and multilingual survey research, has over 30 years of experience in language and cultural research, and 16 years of experience in survey translation and questionnaire development and pretesting. She taught and lectured at university level in various countries, including United States, China, Hong Kong, and Finland. She also held a position of Principal Researcher and Senior Sociolinguist at the United States Census Bureau for 12 years. She has published widely, including authored and edited books, book chapters, and journal articles in the field of sociolinguistics and survey research. Yuling Pan holds a Ph.D. in Linguistics from Georgetown University, Washington, D.C.
Mandy Sha directs research studies and increases the scientific body of knowledge through publications, international speaking engagements, and professional service. While working on this book, she coedited the 2018 special issue of refereed international journal Translation & Interpreting on questionnaire translation in cross-national and cross-cultural research, presented a seminar at the World Bank on maximizing quality of qualitative research in multilingual and multicultural contexts, and coauthored the Quality of Comparative Surveys task force report commissioned by the World Association for Public Opinion Research and American Association for Public Opinion Research (AAPOR). She chairs the 75th anniversary AAPOR national conference to represent the outlook and leading research in the scientific community, including the topic of applying sociolinguistics to survey translation. Hyunjoo Park is a social scientist with 20 years of experience conducting international marketing and social science research in Korea as well as in the U.S. Ms. Park has experience in both qualitative and quantitative survey research including questionnaire development and pretesting, cognitive interviews, focus groups, interviewer training and monitoring, and statistical analysis. She has published quite a few number of book chapters and journal articles in the field of survey research such as Journal of Official Statistics, Field Methods, International Journal of Social Research Methodology, Quality and Quantity, Survey Practice, Advances in Comparative Survey Methodology Survey Methods in Multinational Multiregional and Multicultural Contexts, including the first Korean survey methodology book. She currently resides in Korea and has been teaching survey methodology courses in a college and a graduate school while supporting various survey projects in and outside of Korea.